If you talked to my husband, he would be the first person to tell you just how sadly technologically inept I am. This post is proof of that very fact. You see, yesterday I posted this recipe. Then, today, I opened up my browser to post a tortellini recipe and somehow wrote over my original post about making this French bread. So, here I am again, sharing this delightful bread with you. Sorry if it isn’t as entertaining as it was yesterday. It will be, however, every bit as delicious. 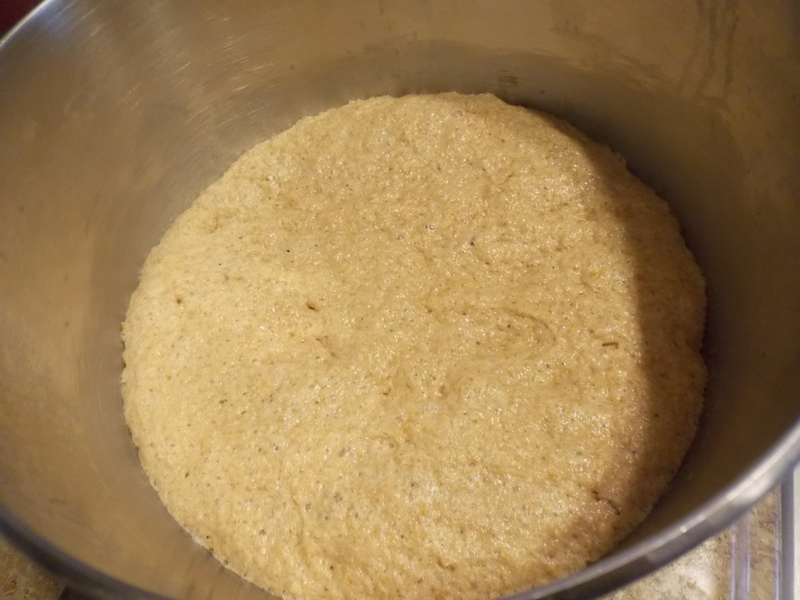 Start by mixing the yeast and water and letting it bloom. Then, use the paddle attachment on your mixer to incorporate the honey, oil, salt and egg. When those are well mixed, add 2 cups of flour and mix until just incorporated. Switch to the dough hook attachment and add remaining flour 1/4 cup at a time until you get a dough that pulls from the sides, sticks to the bottom and doesn’t stick to your finger when you touch it. 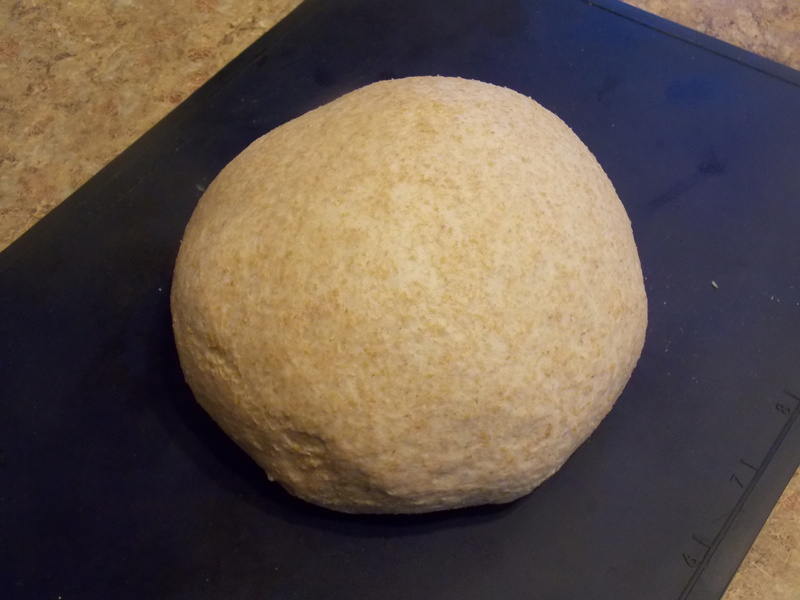 Knead dough for 5 minutes. Cover this and let it rise at room temperature for 2-3 hours. 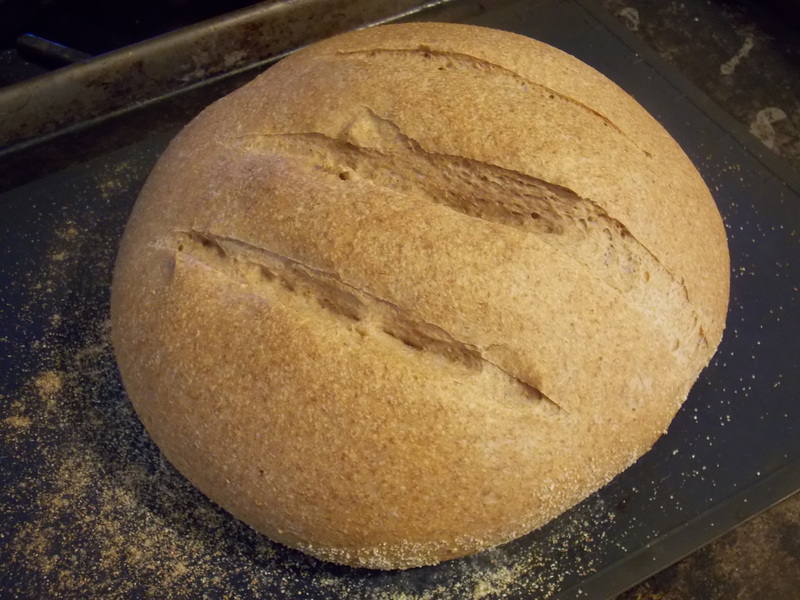 The long rise time helps the inside of this bread stay nice and moist. After three hours, my dough looked like this. Carefully remove this dough from the bowl. I just hold it in my hands and tuck the edges under continuously until I have a nice, round, taught, round loaf. Set that loaf on your baking sheet and let it rise uncovered for another hour. The outside will dry out some and that is good. That dryness helps you get a nice, crispy crust. Don’t forget to dust your baking sheet with cornmeal like I did, or you’ll have to pick your loaf up again. Halfway through your last rise, heat your oven to 500* (or as hot as it will go). Place a pan on the oven floor while the oven heats. Use a metal pan for this, not glass (don’t ask how I know, just trust me on this one). Just before you place your dough in the oven, slice a couple of slits in the top with a sharp knife (or a razor knife). The outside may crack some and that’s just fine. Placed this loaf in that hot oven and pour a half cup of water in the pan you preheated. Close the oven immediately. All that trapped steam will do wonders for your crispy crust. I don’t know why this works, but it does. Bake it for 10 minutes before you reduce the oven temperature to 350*. Continue baking at the lower temperature for 10-15 minutes or until the outside is golden and the loaf sounds hollow when tapped. Let this cool as long as you can before slicing with a serrated knife. Its good just like this. It’s even better toasted with some nutella, but I only do that after the kids are in bed. Usually I serve it alongside a piping hot soup or a hearty bowl of pasta. Stir together yeast and water. Allow to bloom for 5-10 minutes. Using the paddle attachment on your mixer, stir in the honey, oil, egg and salt. Mix until completely incorporated. Add 2 cups of the flour and mix until just combined. Switch to the dough hook mixer attachment. Add more flour 1/4 cup at a time. 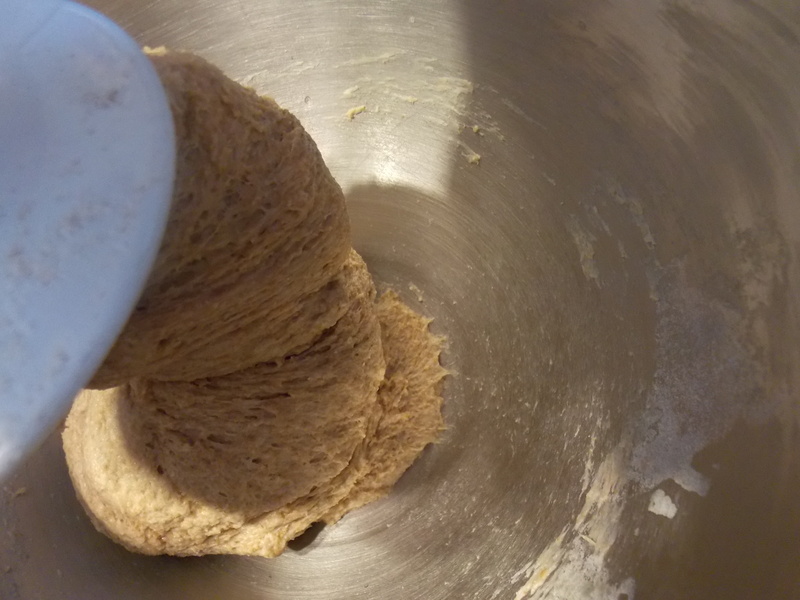 Mix in just enough flour to form a dough that pulls away from the side of the bowl, but still sticks to the bottom. It should not stick to your finger when you touch it. I used about 3 1/2 cups total. Knead this dough for 5 minutes. Cover and let rise at room temperature for 2-3 hours. 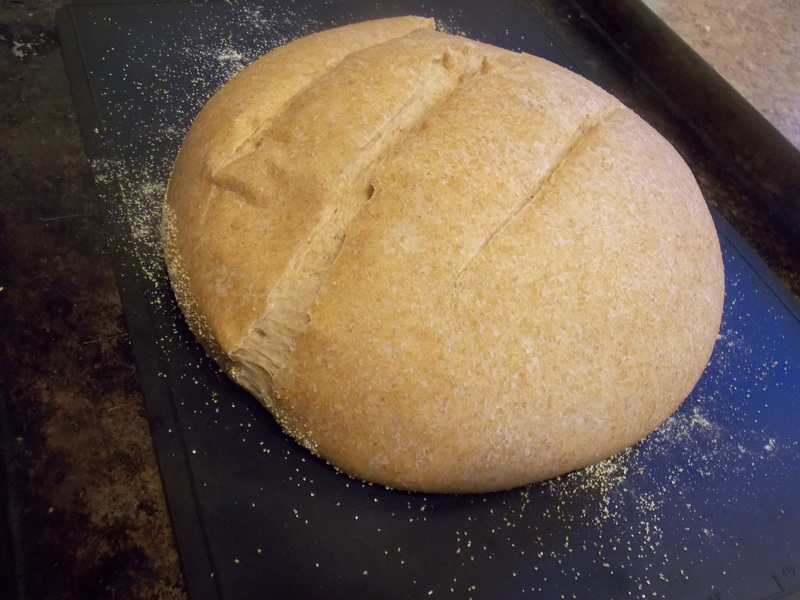 Carefully remove from bowl and form loaf by tucking edges under and shaping into a ball. Place on a baking sheet dusted with cornmeal. Let rise uncovered for 1 hour. About halfway through the rise, preheat your oven to 500* and place a tall sided metal pan on the oven floor. 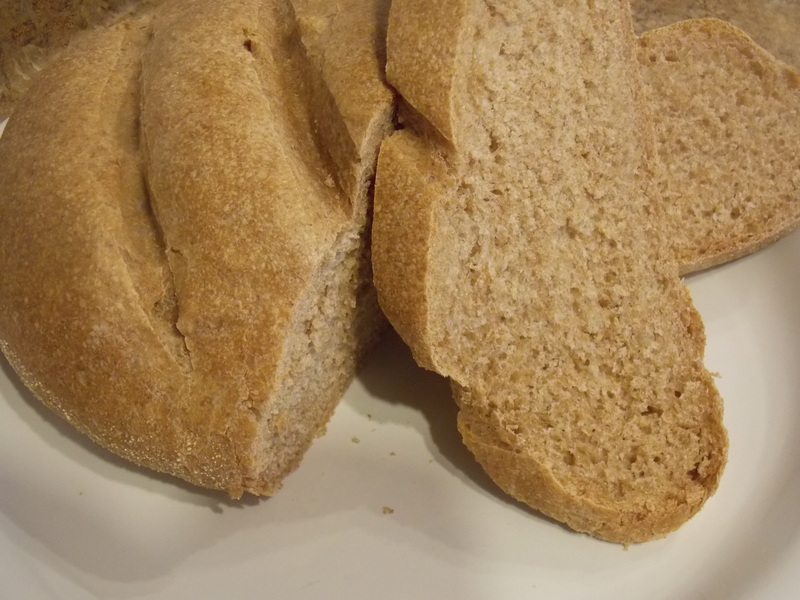 Just before baking, slice 2-3 slits in the top of your loaf with a sharp knife (or razor knife). Place baking sheet in hot oven and pour 1/2 cup water in the preheated pan on the oven floor. Close oven door immediately. Bake for 10 minutes. Reduce heat to 350* and bake an additional 10-15 minutes or until loaf is golden brown and sounds hollow when thumped. Two posts in one day?! Yeah, that’s right. I’m trying to make up for the last couple of weeks. Not really, but this is important and time is of the essence. Some of you might remember about a month ago when I took some time to help with an adoption benefit dinner. If not, you can read about it here.The Bowlings are thisclose to having all the funds they need for adoption and travel and they expect travel orders any time now. The past month they have been part of a fundraising campaign for families who are close to their travel time and still need additional funding. Today is the last day to donate to that campaign and help the Bowlings out. You can donate tomorrow and help an entirely different set of families. Here’s how it works. You follow the link below and commit to a $5 (or more) donation for 5 months (or more) and it goes to help 5 families each month. That’s at least 25 orphans that you can help get out of orphanages (or institutions) and into homes full of warmth and love. Five dollars a month really isn’t that much. Can you give up your Venti latte one day a month to help these children find hope and love? Click here to donate now! Just a heads up to all my readers. This is a busy weekend for me, so I won’t be posting any new recipes until Monday. In addition to the usual football game and church, my husband’s birthday is tomorrow and I’ve got to clean the house up for company and cook for him. Just as exciting as that, is the spaghetti dinner, silent auction and dessert auction I’m helping with on Saturday. I’m making two desserts and helping before, during and after the dinner. I am so thankful to be part of helping a loving family bring home two special-needs children, a girl and a boy. International adoption is expensive, but watching God provide a way has been such a blessing. If you’d like to read about the Bowling family’s adoption journey, you can do so here. You can also find a link to their donation page on that blog. If you live near me, come out for the spaghetti dinner Saturday night. If you don’t, you can still participate by bidding on silent auction items online. They can be found here. Online bidding ends on Saturday at noon MST. Enter your email address and message in the box on the right side of the page to place your bid on one of these fabulous auction items. All monies raised goes directly to bringing these beautiful children to their loving family.